Sheridan's solicitor makes statement Jump to media player Former MSP Tommy Sheridan is convicted of perjury following a 12-week trial at the High Court in Glasgow. Tommy Sheridan 'spoke of swingers club', court is told Jump to media player Former MSP Tommy Sheridan admitted to political colleagues that he had twice visited a swingers club, a court has heard. Glenn Campbell reports. 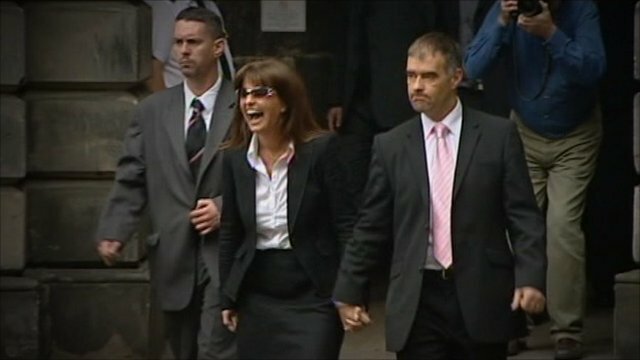 Tommy Sheridan has been convicted of perjury following a 12-week trial at the High Court in Glasgow. The 46-year-old former MSP was found guilty of lying during his successful defamation case against the News of the World newspaper in 2006. Tommy Sheridan's solicitor Amar Anwar read out his statement outside court, in which he expressed his anger at News International, saying "I make no apologies for taking on the might of Rupert Murdoch". His wife Gail also expressed her loyalty to her husband as she stood by his side.